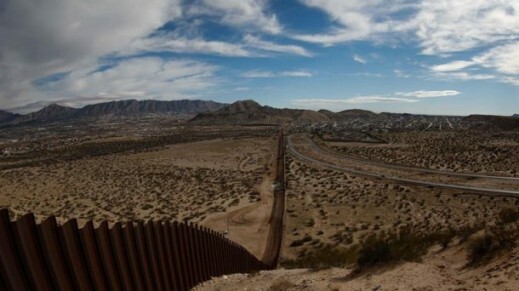 The US president, Donald Trump has signed the executive order this Wednesday authorizing the construction of a wall on the border with Mexico, as he promised to do in the election campaign. Trump has taken advantage of his visit to the Department of Homeland Security to stamp his signature in decrees relating to security, both border as inside, and to advance this way in a few plans questioned by its neighbor of the south. The president has explained in an interview that his goal is to start raising the wall “as soon as possible”. “As soon as it is physically possible”, he explained, hours before signing the executive order. Thus, although the planning will begin “immediately”, the works could still be delayed several “months”, added Trump, who sees this wall a tool against smuggling at the border. “It will be good for Mexico. We want a Mexico very stable and very solid”, he said. The US president has insisted during the interview in which “always” has said, that the construction “will in some way reimbursed by Mexico”. Trump has not clarified how – has admitted that it can be “tricky”, but has stressed that it will make to the neighboring country to assume the “one hundred percent” of works that the Government of Enrique Pena Nieto already unchecked. “I regret and deprecate the US decision to continue the construction of a wall that since years ago, far from united, divides us. Mexico does not believe in walls. I’ve said again and again, Mexico will not pay for any wall” Said Mexican President Enrique Pena Nieto in a televised message. Moreover, to the demands of cancellation by Mexican politicians, the foreign minister of Mexico, Luis Videgaray, said that the meeting of President Enrique Pena Nieto with his US counterpart Donald Trump, scheduled for January 31, still stands. On the other hand, Donald Trump has also signed an executive order to deny federal funds to so-called “sanctuary cities”, which protected the deportation to the undocumented. Thus, federal funds will be abolished to cities that refuse to provide information to federal authorities about the immigration status of people they stop, among which include Chicago, New York and Los Angeles. Earlier, in his daily press briefing, spokesman for the White House, Sean Spicer, explained that under the plan to reinforce the border with Mexico will increase the number of agents and create new detention centers for immigrants apprehended in the border. During the election campaign, Trump has already promised to act against these cities, called “sanctuary cities”, numbering about 300 in the United States.